Patti Poppe accepted her position as CEO of Consumers Energy in July 2016, and by February 2018 she had ushered through a corporate goal of stopping the burning of coal by 2040 and reducing carbon emissions by 80% in that same time. 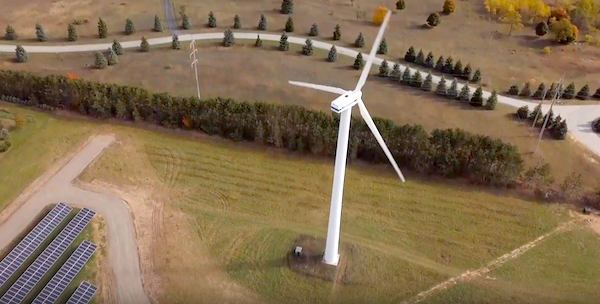 The initiative at a Top 20 utility earned headlines nationwide and positioned both Consumers Energy and Poppe as national leaders in the fight to slow global warming. 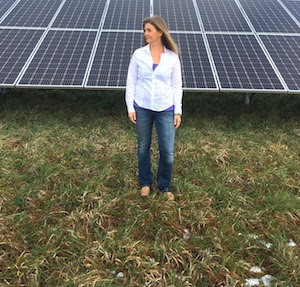 Groundwork has since invited Poppe to serve as the keynote speaker at our Michigan Clean Energy Conference, May 21–23—an offer she has graciously accepted. (Conference registration opens Feb. 8!) In the meantime, we asked her to share thoughts about the globally significant transition that Consumers has embarked upon. Word is you used to have an “I heart coal” bumper sticker on your car. But then you led one of the nation’s largest utilities to a zero coal future. What drove that remarkable change? Yes, that’s true. I was proud of our coal plants that powered Michigan. But when I came to understand the science of climate change, I knew we had to do something different. And we did a lot of homework to figure out what we had to do. There was a time in our company when there was a lot of denial about climate change. Many people here said climate change was alarmist and they didn’t believe it. And I can say that at first I did not do my homework either. What happened to bring about that change? We did a forum where we brought in opposing viewpoints with supporting information. Because what you really see is that people on both sides do not really have a good scientific basis for what they think about this. When you ask people why they think climate change is real, they say, “Because I believe it.” And when you ask people who doubt climate change, they say, “Because it’s alarmist.” So we had people come in and I did my homework and I learned the science and it became clear that we could be part of the solution to reducing carbon emissions. It was a no-regrets move. And that is especially true if we can do it in a way that does not economically harm customers. Also, within the company, some people retired and new people came onto the team who had different points of view. It seems the one thing you always hear from people who deny human-caused climate change is that Earth has always gone through transitions, and this is just one more transition. It’s true, Earth has gone through transitions, the climate is always changing, but when you look at the carbon charts based on the ice cores and at the ocean acidification charts, it’s hard to deny the impact of carbon. But the thing is you have to look at them. How difficult was it, given the emotional culture of Consumers Energy at the time, to get consensus around the zero-coal goal? It was very interesting. With the new voices in the conversation, it was actually not difficult. People were open minded, and when you see all sides of the discussion, you can have consensus. We wanted to stand for leaving a lasting legacy that we could all feel proud of. As a team, that legacy is based on the triple bottom line: people, planet and prosperity. Closing seven coal plants. That means something in America today. Yes, it was very significant. That was more coal plants retired than by any investor-owned utility in the nation. Newsweek named us one of the top 10 greenest companies in the nation—not just top 10 utilities, but of all companies. Stopping coal has many other environmental effects too. It reduces water use. Reduces waste to landfills. Reduces carbon, of course. So that was step one. Step two was making an ambitious goal for elimination of coal. We set 2040, which is a decade earlier than the Paris climate agreement. And the third step was the integrated energy plan. We have to file that plan with the Michigan Public Service Commission. This change represents such a whole new way of thinking, I’m wondering how it has affected the culture of the company. Does it just plain feel different at Consumers today? That’s funny. Nobody ever asks me that, but yes. It does. It feels much more entrepreneurial. More inspired. In fact, some of our newest employees came to Consumers specifically because of the commitments we have made. And some people who have been working at the company for a long time are so proud of the company for taking this stance. I don’t mean just senior management. The purpose-driven culture gives extremely high leverage. People are really enthusiastic about being part of this team. Here are two examples. We have two pilot projects in the state. One is in Grand Rapids, on the west side, and we worked with developers to create a block that demonstrates the newest energy technologies. We are putting in a new facility there, and that becomes an attraction for future employees to come work there. It’s a cool neighborhood, so you can live near your office and walk to work. And in Jackson, we announced a smart energy district, a block of downtown where we’ll be taking the clean energy goals and accelerating them in this clean energy district. There will be a public library, hotel, multi-use with residential up and retail down. Solar on the rooftops. Battery storage. It will be a microcosm of this new universe where we can demonstrate clean energy. What did you hear from other utility CEOs when you made your coal-free announcement? I would say about two-thirds of them said, “Good job.” And another one-third don’t have faith in new technologies and have doubts about renewables’ ability to cover base load power and about the ability to optimize energy. But two-thirds are making moves similar to what Consumers did. This point about renewables being economical, that the customer doesn’t have to trade-off anymore—the economic models are on the side of the planet now. Even if you don’t care one whiff about the planet, you still make the change based on the economics. It’s too late to save coal. You can’t save coal. The economics won’t allow it. Even just considering the waste associated with using coal. The waste at the mine. The waste getting it onto a train. The train traveling. Processing it for fuel at the plant before you can even burn it. Versus … the sun! Coal just doesn’t make sense anymore. And that helps even the old school folks come around the corner. Even when you know you are doing the right thing, I’m guessing the human side of closing plants makes it a bittersweet thing. Most utilities around the nation have an aging workforce. When we were closing our seven plants, I went to one when it was the last day of operating. I went to the control room. It was very emotional because there were 75 people in the room, and I asked how many of them were retiring tomorrow. And about half raised their hands. Many delayed their retirement to fulfill their duty to that plant. The other half had new jobs in the company. That plant had provided power to Michigan for 75 years. There was not a dry eye in that room. When I went to the plant, I didn’t know what to expect. Would there be picketing? Would everybody be mad at me? But I said it is our obligation to bring energy in the cleanest form possible. They nodded. They got it. Groundwork's Michigan Clean Energy Conference is focused on getting deals done and infrastructure built. Sign up!